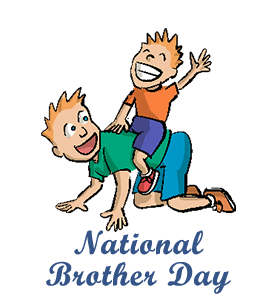 ﻿National Brother Day: Calendar, History, Tweets, Facts, Quotes & Activities. National Brother Day seeks to celebrate brothers, the male sibling and their contributions to each and every one of their families. It seeks to celebrate the bond between brothers and its significance. National Brother Day is an unofficial national holiday that is annually celebrated on the 24th of May. It is not to be confused with National Sibling Day, which is celebrated in April. According to Jeffrey Kluger, author of The Sibling Effect, after approximately six years, your stepsiblings can become as close to you as biological ones. Take a brother out for a meal and discuss cherished family memories together. Some great places to take out your brother would be a favorite restaurant of his or a spot that is meaningful to you both from your past. Watch a movie about brotherhood. Some suggestions are: Boyhood (2014), Four Brothers (2005), Boyz N the Hood (1991), and The Tree of Life (2011). Read a book about brotherhood. Some suggestions are: The Sibling Effect , Brother , and The Dead Man’s Brother .